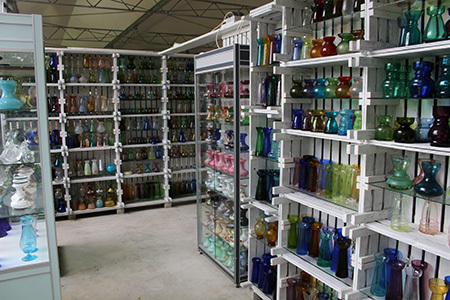 This collection of hyacinth vases (bulb vases) belonging to Wim Granneman is for sale. 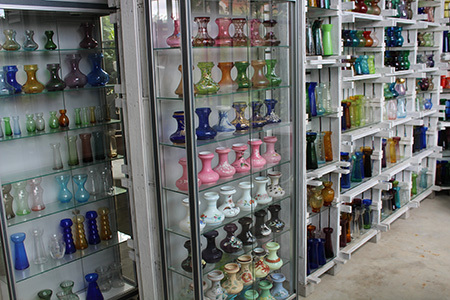 The collection consists of many more vases than shown on this website. Parts of the collection have been on exhibition in various museums. 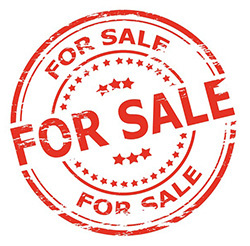 The collection is also for sale in parts, for instance by country of origin. For more information: please use the contact form. 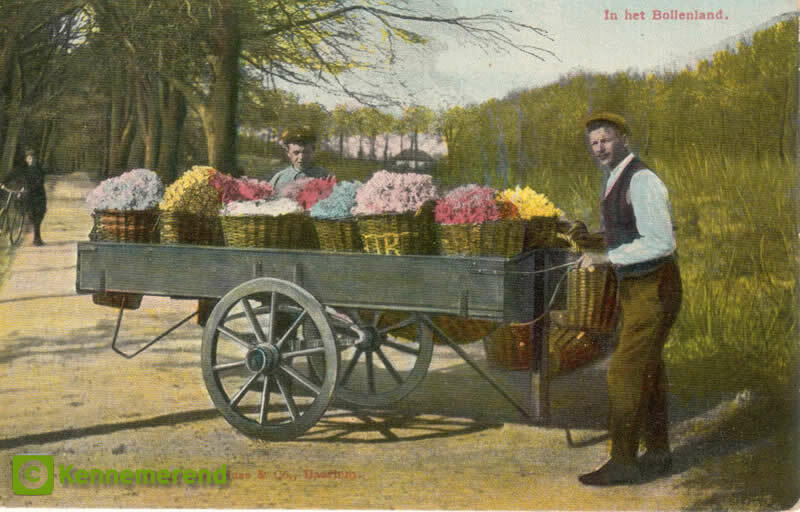 Deze collectie hyacintglazen ( bollenglazen) van Wim Granneman is te koop. De collectie is heel veel groter dan op deze website te zien is. Delen ervan zijn al in diverse musea tentoongesteld. De collectie is ook in gedeeltes te koop, bijvoorbeeld per land van herkomst. Voor meer informatie kunt u het contactformulier invullen. Diese Sammlung von Hyazinthengläsern (Zwiebelvasen) von Wim Granneman ist zu verkaufen. Die Sammlung ist sehr viel größer, als hier auf der Website gezeigt wird. Teile davon sind in den vergangenen Jahren in Museen ausgestellt worden. Die Sammlung ist auch in Teilen zu verkaufen, z. B. nach Herkunftsländern. Für mehr Informationen benutzen Sie bitte das Kontaktformular. Уникальная коллекция ваз для гиацинтов ( вазы под луковицы), принадлежащая Виму Грэннемэну, выставлена на продажу. В коллекции намного большее количество ваз, чем можно увидеть на сайте. Частично коллекция не раз выставлялась в различных музеях. Коллекция также продаётся частями, например, исходя из страны происхождения. Для более подробной информации, пожалуйста, воспользуйтесь формой для контактов. Cette collection de vases à jacinthe (vases à bulbe) de Wim Granneman est à vendre. La collection est beaucoup plus grande que montré sur le site web. Beaucoup de vases de la collection ont été exposés dans des musées. C’est aussi possible d’acheter des selections, par example selon leurs pays d’origine. Si vous êtes intéressés, svp usez le questionnaire. This site provides information about collecting hyacinth and other glass bulb vases, tells you about the process of forcing bulbs on them indoors and shows some of their colourful beauty and great diversity. A chapter about crocus pots is also included. 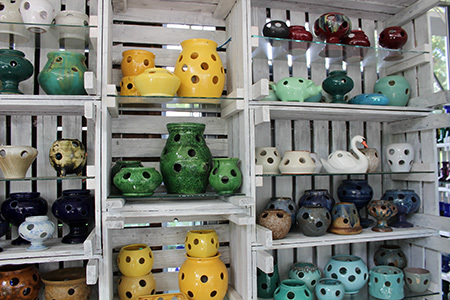 Hyacinth and other bulb vases in many shapes and colours. For centuries it was a popular tradition especially in Western Europe, Scandinavia and the United States to buy flower bulbs in autumn and force them to flower indoors in the wintertime. The hyacinth became the favourite among these bulbs, especially for forcing on glass vases. When the specially prepared hyacinth bulbs were put on vases filled with water and placed in a cool location for some time, roots developed and after bringing them into the warmer part of the house, they showed their fragrant flowers from Christmastime onwards. On this website you will find information on hyacinth vases and vases for various other bulbs. I will refer to them as vases. In Holland and Germany however the vases are usually called in Dutch: 'hyacintenglazen', or in German: 'Hyazinthengläser', translated into English: 'hyacinth glasses'. The term "hyacinth glasses" can be found as well in older English and American catalogues. Vases specially made for forcing other bulbs like amaryllis and crocuses are also discussed on this site. A separate chapter deals with ceramic crocus pots. 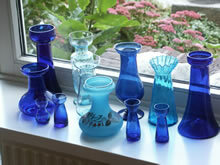 Different blue bulb vases in the window-sill. Also without bulbs, nice to look at. 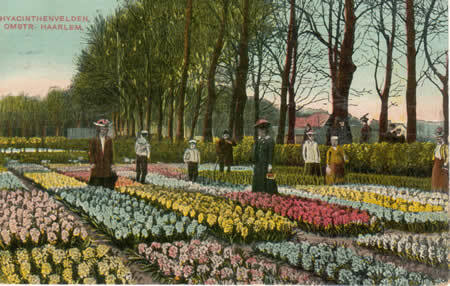 People viewing the beautiful hyacinth fields in the outskirts of the city of Haarlem in 1910. 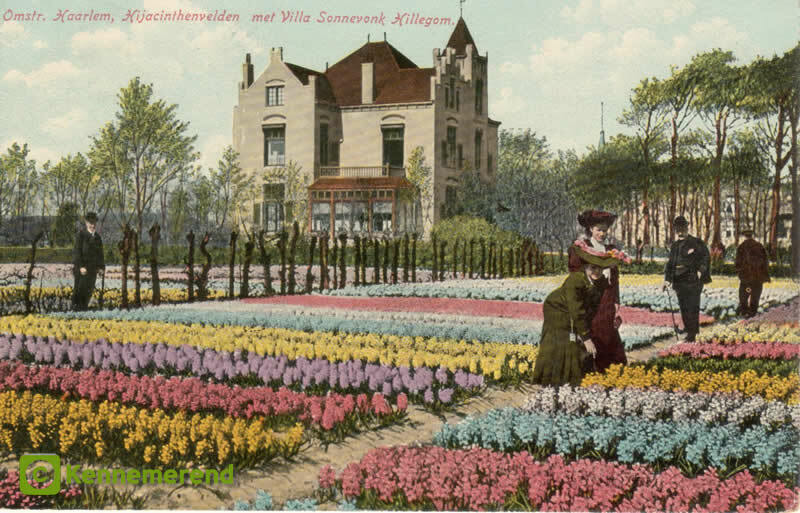 Postal card of ca 1910 of Hillegom. Nothing nicer than posing in the fragrance of a flowering hyacinth field. Harvested hyacinth-flowers. Removing the flowers is better for the bulb-growth. More than four centuries ago the professional growing of flower bulbs was started not far from my home, around the city of Haarlem, west of Amsterdam. In the 17th century the tulip bulb trade resulted in the world-famous "Tulipmania", when tulip bulbs were sold at gigantic prices. About a century later the same happened with the hyacinth bulb, albeit on a smaller scale. The hyacinth became the flower of fashion! Soon the growing of hyacinths on glass was to follow, mainly to bring the flowering of the bulbs forward and have the blooms on one's windowsill in midwinter. All the more reason why I started collecting the beautiful, colourful and decorative bulb vases. This website aims to give you a survey of the many different designs produced over the last centuries and the growing of bulbs on them. However the pictures show only a small sample of the great diversity of existing vases! Perhaps the site will encourage you to start collecting them or forcing bulbs on vases in the home! 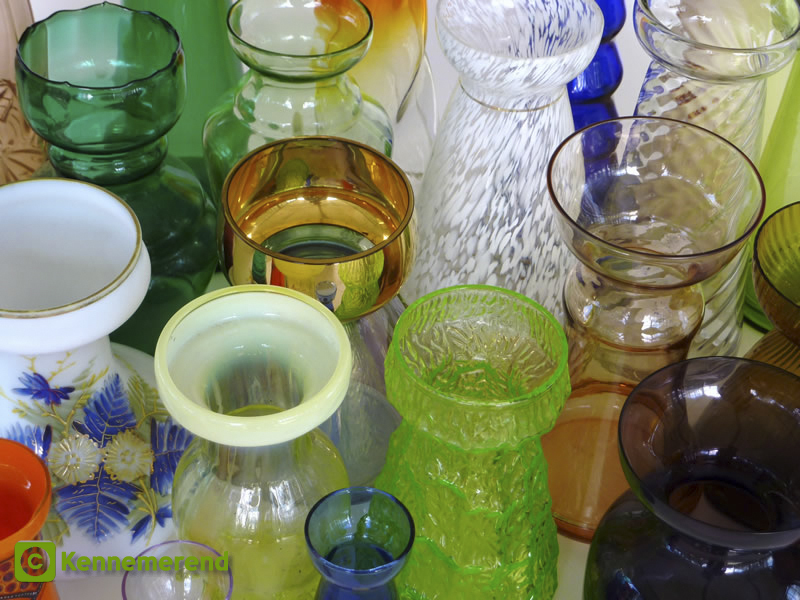 Enjoy watching the sunlight shining through a row of these colourful vases in your window sill. Good collecting! Collecting hyacinth vases is fun! First of all, I would like to express my thanks to Jet Schokker and Robert Sutcliffe for all their help with the English language. I am grateful to Willy Peelen for putting pictures at my disposal of her forcing experiments on those most exceptional ‘antipode bulb vases’ and Gjalt Welling for the beautiful picture he made of my collection of Leerdam vases. The latter was first published in the book ‘Bloeiend Glas’ (Flowering Glass) of 2009, the book in which Sytske Welling Wester published her chapter on Dutch bulb vases. The results of her extensive research on this subject were a great help to me in describing the Dutch bulb vases of this site. My son Jan-Willem, I would like to thank for starting this project in 1998 and his help on the first three versions. And last but not least, I owe Miek Stap of Stap Projects my gratitude for her patience and all her work on the creative design of this, much more extensive, fourth version of the website. 2018 August - Collection for sale! © Wim Granneman, Netherlands. All rights reserved. No part of this site may be reproduced, in any form or by any means without the express written permission of the owner (Wim Granneman - Kennemerend). Glass Encyclopedia - Extensive online info on glass. 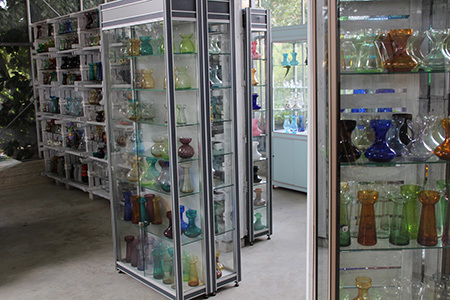 Pamela Wessendorf - Press glass Museum - Huge collection of pictures on pressed glass.